If you are searching for dog training classes in Seattle or puppy training classes in Seattle, consider the advantages of Seattle Family Dog Training. Perhaps you have a new puppy or a rescue dog or perhaps your dog simply exhibits irksome behavior such as excessive barking, jumping on your guests or dragging you along during your walks at the park. All of these behaviors and much more can be corrected with proper dog training. Our method is different from other dog training services in that we teach owners how to teach their dog companions the proper way to behave. These lessons are most effective when they come from you; after all, you are the one who will be spending the most time with your furry friend. Proper dog training not only corrects problematic behavior, it also improves the bond between dog and owner and helps you better understand your dog and his or her unique personality. Our methods will help you understand your dog’s personality and while he cannot speak, he does have ways of communicating and we can help you understand these cues. At Seattle Family Dog Training, our dog training program can help you have your dog behaving properly in just five weeks. Our lessons include everything from teaching a dog to walk properly on a leash to curbing problems such as bolting out of your front door, barking excessively, jumping on you or others and dis obeying the rules in your home. These are just a few issues we target, and you will be amazed at how quickly your dog will respond to the training. Our training is not based on a reward system, you won’t need treats or other incentives in order to improve or maintain behavior. Our program is designed to improve all of your basic obedience issues, and we have classes for puppies as well as classes for dogs that are older than seven months in age. We also have a special program that we have created specifically for aggressive adult dogs. If you have a dog with aggression issues, contact us and let’s get started on transforming your pet and eliminating these serious issues. 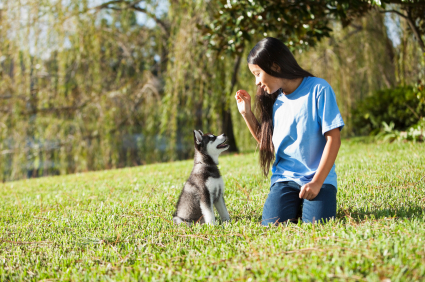 We offer a program with 12 private lessons designed to teach standard obedience skills but also to specifically deal with issues of aggression that your dog displays against other dogs or people. This training can help make life with your pet far easier and eliminate many worries you have about your dog’s behavior.